When Vancouver redeveloped its South East False Creek area in preparation for the 2010 Winter Olympics, it also worked to restore its historic Salt Building - which turned out beautifully as you can see from the photo above. Built in the 1930s and used as a sea salt refinery, the Salt Building sits in the former industrial area and now serves as a space for events and as a multi-functional building with restaurants. The renovation was handled by Acton Ostry Architects with the aid of Jonathon Yardley Architect and is aiming for LEED Gold certification for Core and Shell. 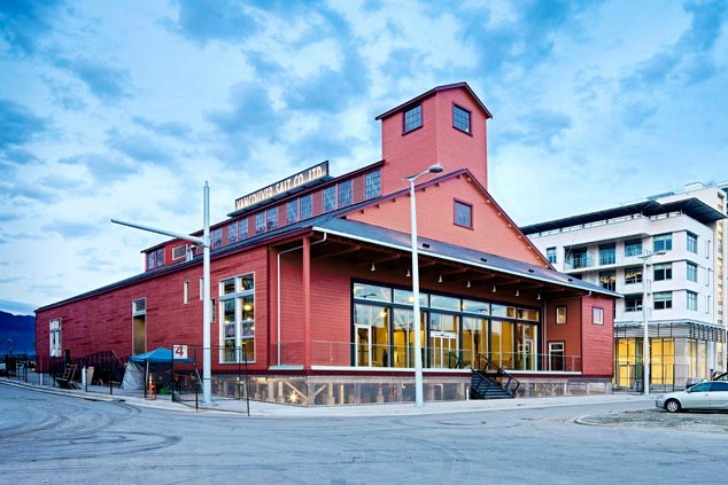 The adaptive re-use project was unique in that it was not only a historic renovation, but also a sustainable renovation project and establishes the heavy timber building as an iconic landmark. The historic waterfront building had to be raised up by updating the foundation with galvanized steel pile extensions to meet the surrounding neighborhood street level. For the rehabilitation of the shell, more than 75% of the existing building envelope was reused and retrofitted. 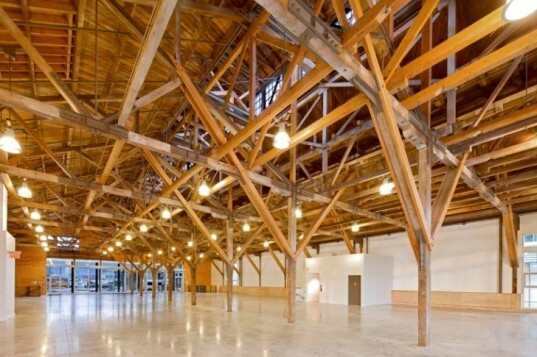 The heavy timber truss system inside was also restored and upgraded to insure its structural integrity. Skylights in the top of the roof let natural daylight stream down through the rafters and natural ventilation keeps the space cool when necessary. A high efficiency mechanical and heating system ensures energy efficient operation. Heating is actually supplied via a radiant floor heating system that draws energy from a neighborhood energy utility that reclaims heat from sewage wastewater. During construction, 98% of construction waste was diverted from the landfills. Upon completion of the historic renovation, the Salt Building was used frequently during the 2010 Vancouver Olympics as a event space. The city had hopes that it would become a entertainment space and be converted to include a number of restaurants. The building is currently for lease as a “prime restaurant/retail/service space”. Seems like a red hot and green space to have a pretty swanky farm-to-table restaurant, right? The historic waterfront building had to be raised up by updating the foundation with galvanized steel pile extensions to meet the surrounding neighborhood street level. For the rehabilitation of the shell, more than 75% of the existing building envelope was reused and retrofitted. The heavy timbre truss system inside was also restored and upgraded to insure its structural integrity. Skylights in the top of the roof let natural daylight to stream down through the rafters and natural ventilation keeps the space cool when necessary. A high efficiency mechanical and heating system ensures energy efficient operation. Heating is actually supplied via a radiant floor heating system that draws energy from a neighborhood energy utility that reclaims heat from sewage wastewater. During construction, 98% of construction waste was diverted from the landfills. Upon completion of the historic renovation, the Salt Building was used frequently during the 2010 Vancouver Olympics as a event space. The city had hopes that it would become a entertainment space and be converted to include a number of restaurants.